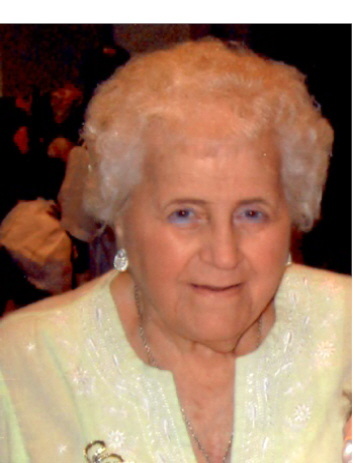 Eleanor S. (Rao) Gonsalves, 83, of Milford, formerly of Whitcomb House, died peacefully, Thursday, June 28, 2012 in the Beaumont Nursing and Rehabilitation Center in Northbridge. She was the wife of the late John Gonsalves who died in 1986. She was born in Worcester, daughter of the late Charles and Emma (Balzarini) Rao and lived in Milford most of her life. She was educated in the Milford schools. Mrs. Gonsalves was an active member of the Whitcomb House resident council and chorus, a member of the Sacred Heart Women’s Guild, an active member of the handicapped commission in Milford and the founder of the Maher Court Association. She is survived by one son John Gonsalves and his husband Samuel Sanzone of Penacook NH, one daughter Stephanie and her husband Robert Tocchi Sr. of Milford, one sister Frances Brunetti of Dennisport, three grandchildren Melanie and her husband Thomas Burns of Milford, Rebecca and her husband Stephen Kiley of Uxbridge, Robert Tocchi Jr. of Milford, five great-grandchildren Griffin Burns, Spencer Burns and Dylan Burns all of Milford, Grady Kiley and Jordan Kiley both of Uxbridge and her longtime companion Anthony Mussulli of Milford. She was predeceased by three brothers Charles Rao, Albert Rao, Roger Rao and one sister Mary DiVittorio. Mrs. Gonsalves loved her family and cherished her grandchildren and great-grandchildren. The funeral will be held Tuesday, July 3, 2012 at 9 A.M. from the Consigli-Ruggerio Funeral Home 46 Water St. A mass of Christian burial will be held at 10 A.M. in Sacred Heart of Jesus Church 7 East Main St.
Burial will follow in the Sacred Heart Cemetery on Medway Rd. in Milford. Calling hours will be held Monday from 5 to 8 P.M.
Eleanor was a beautiful woman inside and out.Our family shared many happy times with her and we are fortunate to have so many memories of her.She will be missed.Our sincere condolences. Thank you Eleanor for being a great companion and friend to our father. He will miss your singing,stories,laughter and phone calls.He already misses you very much. You and your family will be in all of our prayers. Eleanor had such a wonderful spirit, she will be deeply missed. Eleanor had a special place in my heart, I feel very lucky to have known her. My deepest sympathies and love to Eleanor's family. A woman with a song in her heart, a dance in her step, a smile on her face and neverending love to give. This was your mother, mother-in-law, aunt, grandmother, greatgrandmother, & friend who touched all of your lives. But you also touched hers. She will always be a part of all of you and is now at peace wrapped in your warm love forever. With our love in sympathy and understanding.